The fashion center of the Philippines is actually Metro Baguio. The metro that covers La Trindad, Itogon, Sablan and Tuba showcases different fashion statements of people worldwide, ranging from American cowboy attires to Londoners rainy day outfits. Metro Baguio has tens of thrift shops that offer second-hand yet original gowns, casual attires, boots, t-shirts and bags. Tourists visiting Baguio are planning not to just go to the famous Strawberry Farms of La Trinidad or eat at Zio's Leonard Wood Pizzeria, but also shop in wagwagan/ukay-ukay centers. However, rain is really an ultimate kill-joy element of life. Baguio, the second coldest city in the world that homes thousands of Igorots who are the natives of the Cordilleras, needs more convenient stores where anyone could just shop in even when the light-nights and thunders are fighting. Thanks that Zalora came in. Zalora is a trusted online store that Igorots would surely love. The online store sells fashion items for men, women and kids. Zalora offers affordable heels, flats, sandals, slippers, shoes, dresses, containers, tops, sneakers, cosmetics, shorts, t-shirts and other products that everyone needs. Among the featured Zalora brands are international names like Aquazorb, Vulli, Carpetworld, Crimson, Dwell Studio, Ellesse Italia, Gibi Shoes, Lured, Moving Comfort, New Balance, Skull Candy, Via Uno and others. Zalora is a worth-recommending fashion online store. Payment methods include Visa, MasterCard, Paypal, G-Cash, BankNet, BDO and BPI bank transfers. Actually, all Philippine banks are supported. Zalora is available in other Asian countries also. My fellow Igorot online shoppers, here is the deal. With a minimum purchase of P500, you can have a P250 discount using our voucher. Just enter this code: “CHRISTIANALIGO12R” when purchasing. I hope the P250 amount is big enough for your savings. Click here so see the products that are needed this rainy season. 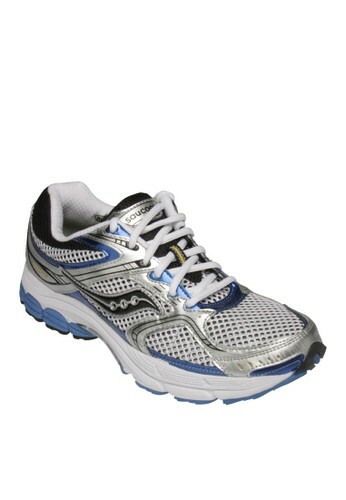 The Powergrid Stabil CS2 from Saucony has an upper made of lightweight Stability Arch-lock for a snug and supported fit. It has a sweat-wicking Hydrator lining and Comfortride Sockliner for superior cushioning. The midsole features Suacony's patented impact-absorbing Heel Progrid with Respon-tek and dual density Superlite EVA blend rubber. The outsole is made of XT-900 carbon rubber material and Injection blown rubber with enhanced cushioning compounds. Weighs 13.6 oz.